This sort-of review but more of an analysis of Rock Hudson‘s performance was originally written on June 1, 2007! NOTE: It helps if you’ve seen Giant before reading this piece. If not, set aside 200 minutes and watch it, then come back here. Giant is funny. It’s not filled with LOL funnies, but it’s got a wink-wink sense of humour (whether that was intentional or not). Wit is laced throughout the picture as Texas cattle magnate Jordan “Bick” Benedict struggles to maintain one iota of control over anything in his life. His wife won’t listen to him. His kids won’t listen to him. His rival outdoes him. Yet through it all, there’s Bick, strutting his big Texas stuff and yet continually coming up short. Not that he’s an unlikable character, especially since Rock Hudson plays him with a nice mix of bravado and delicacy. He truly loves his family and like most tough-guy dads, his daughters have him coiled completely around their pinkie fingers. Hudson speaks about director/producer George Stevens‘ ability to sculpt an actor’s performance in one of the documentaries on the DVD. The Rock says a mutual friend told him to just put himself in Stevens’ hands, which paid off wonderfully. It might not have worked as well for co-star James Dean (who, as ne’er-do-well-who-eventually-does-very-well Jett Rink, apparently felt smothered by the director’s meticulous style), but this performance is probably Hudson’s best. Really, for all of Jimmy Dean’s fame and over-hyped talent, Hudson is the better actor in Giant. Bick is the better man, even if he’s not always a nice guy. Hudson’s best scene takes place towards the end of this super-long film. Strangely, it follows a disappointing scene in which Bick challenges a sloshed Jett to a fight to defend his son’s honour and certainly to avenge old grudges too. Bick quickly realizes that beating on a piss-drunk oil millionaire isn’t going to solve anything. This scene is anticlimactic and—as in The Color Of Money and Rounders—it deprives us our pay-off of an entire movie’s worth of a tense rivalry. It only serves to show that, maybe, the middle-aged Bick is finally growing up. Back to the best scene in the picture. Bick is lounging in his posh suite with his family. He gets into an argument with Jordan Junior (Dennis Hopper, in a particularly earnest performance) over what just went on with Jett. With Mrs. Benedict and their daughter framed in the background (and saying nothing throughout most of this scene), father & son bicker about more than just this scrape with Jett. Bick is one of those set-in-his-ways kind of guys and Jordy has gone his own way, becoming a doctor and marrying a Mexican. That’s a terribly disappointing two-step for the old man because he’s a racist who expected Jordy to run the ranch one day. What makes this culture-clash scene so good is that Stevens keeps Huson seated the entire time. No matter how angry he gets, Bick remains in his chair while Jordy stalks around. Maybe this was done out of necessity. The 6’4″ Hudson towered over the 5’9″ Hopper as it was. The size difference would have destroyed this critical one-on-one if the old man had seemed to be physically dominating his hothead kid. In any case, it’s the finest moment in the entire picture. How interesting that a scene could belong to an actor who does so little while the other actor is so demonstrative. Here’s a lesson for Method actors who think they always need to be doing some sort of “business”. Keep still and let the dialogue & story do your work for you. Don’t let ‘em catch you acting. Perhaps Francis Ford Coppola had Giant in mind when he shot one of the great scenes in The Godfather Part II, where Fredo remains seated in Michael’s solarium and shouts with impotent rage. If visuals tell a story as effectively as words in a movie (and they should…or why are we watching movies in the first place? ), these two examples in Giant and The Godfather Part II are terrific examples. Hudson’s chemistry with Elizabeth Taylor (who plays his headstrong wife, Leslie) was not as white-hot as it was when she later worked with her stormy husband/ex-husband/repeat Richard Burton, but it’s awfully good. Taylor was also near her best in this film. She’s the soul and the guts of the movie. Leslie’s “you finally became my hero” speech to her husband at the very end is touching, if corny. Leslie is a source of conflict between Bick and Jett (who wants her for himself and feels like a failure because she’s the one thing he ultimately can’t have), just as Liz was a source of conflict between Rock & Jimmy…if an anecdote in the DVD documentary told by co-star Jane Withers about the 3 headliners is to be believed. 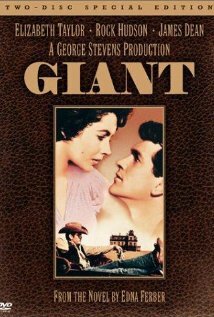 For what it’s worth, Giant marks the only time Rock Hudson was nominated for a Best Actor Academy Award. He was up against Jimmy Dean, who’s actually more of a supporting character. They both lost to Yul Brynner in The King And I. Of course, John Wayne wasn’t even nominated for his career-peak work in The Searchers, so these noms probably mean cowshit on a stick. However, it’s great to see Rock Hudson recognized for Giant. He came a long way from being the guy who needed 38 takes to deliver a single line in Fighter Squadron. Even so, he won’t be remembered for having extraordinary talent. He may have been a movie star, but he wasn’t a particularly great actor. Not until he worked with George Stevens on Giant. And that’s what makes it odd for me to snicker so much during last night’s late-night viewing. I don’t think the film is supposed to be funny. That’s what keeps it together though. After all, the movie is a dust-laden soap opera and its race & class subplots haven’t aged very well. James Dean is given a half-baked character and he struggles to find a point to the whole thing. And I certainly could have done without all the obnoxious yeehawing. As legendary movies go, this one is pretty flawed. At least it has a flummoxed giant of a man at the centre who can’t seem to control much of anything in his life. Bick Benedict might have even provided an example for the Al Bundy/Raymond Barone TV characters. Regardless, Rock Hudson’s best-ever character was steamrolled at nearly every turn and you have to admire the guy for finally admitting that he’s learned some lessons. That’s some good actin’, Rock.